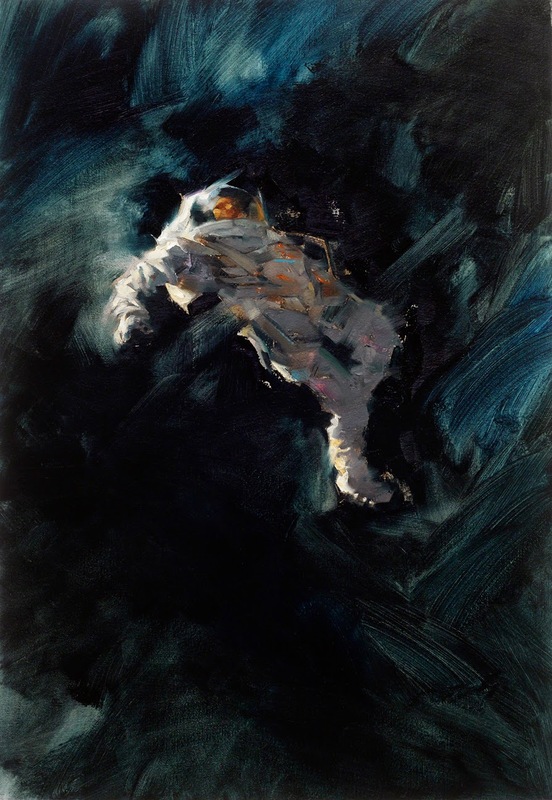 A distressed astronaut against the blackness of space. As simple as that sounds, it takes a lot of time to get a piece like this to work. It has to read fast, it has to read emotionally, and it has to read as paint. As a follow-up post to the latest 10 Things Using Black, this is a good example of using black in nature. Certainly some will laugh and remark that the black of space is of course a natural aspect, and using black to capture it would be a no-brainer. But using straight black here is exactly what I did not want to do. Painting a typical star field with toothbrush flecks of paint for stars would not be the answer either. This cover idea is not about reporting what space looks like. We as viewers and potential readers already know this. It doesn’t need to be repeated. How much time would that take to come up with? And how commonplace would that look on a cover? 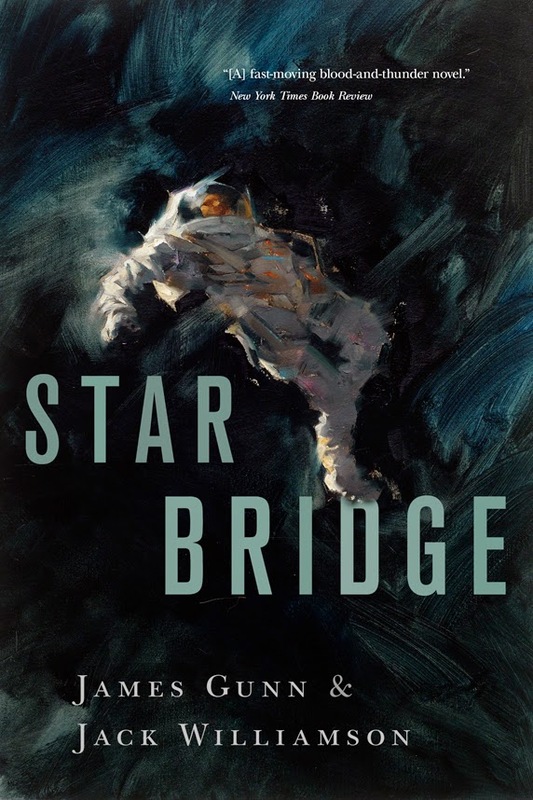 On science fiction book covers, very commonplace. 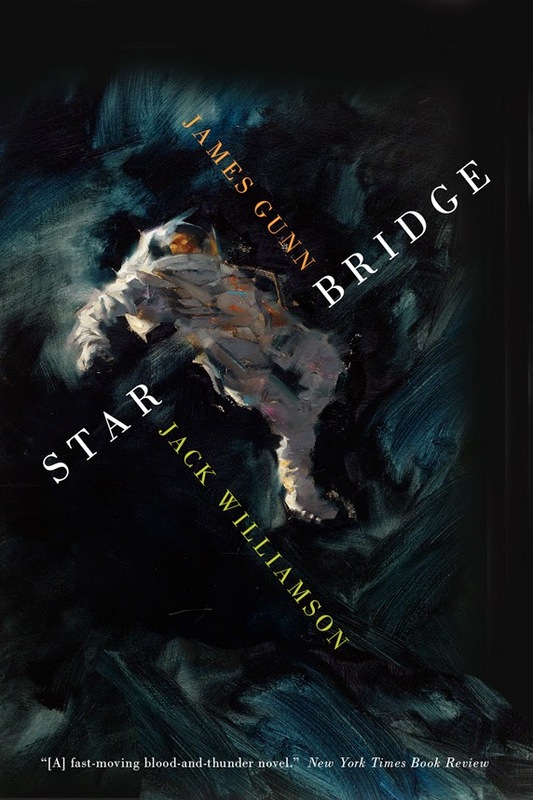 For Starbridge, by James Gunn and Jack Williamson, the art director, Irene Gallo wanted to show the astronaut’s helplessness through body language, and also the blackness that would surround a solitary figure adrift in space. Can you imagine that? Seriously. Nothing around you, at all degrees of vision, nothing but emptiness. Forget the stars. They’re just backdrop at that point. Scary. 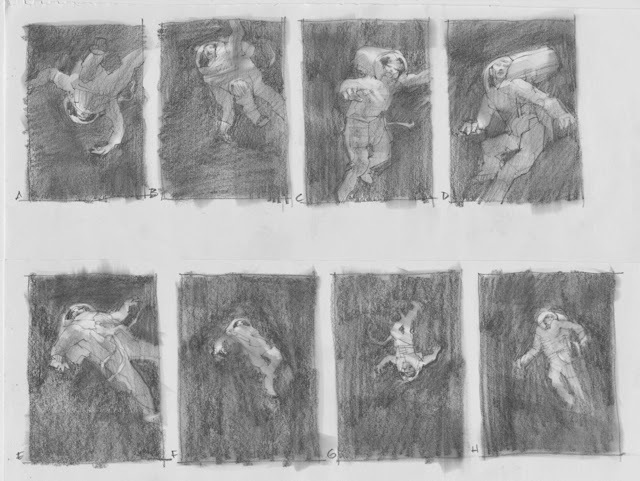 At the thumbnail stage, I realized that there are many ways to compose this. Move close in to the helmet visor, with a reflection of stars in the shield? 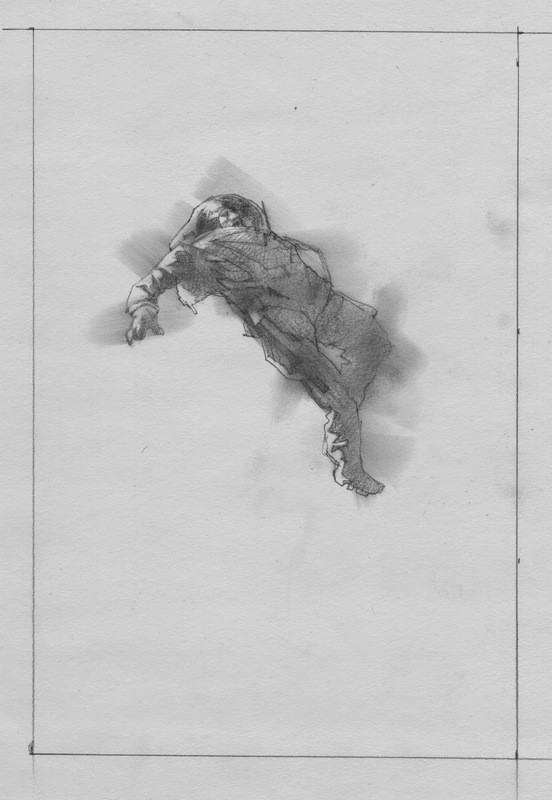 Or back off and let the figure float helplessly in the middle? I drew several attitudes, and we agreed on this one. The body of the astronaut could’ve been in any number of attitudes, but I wanted to see something of the face in the visor. This ruled out several angles. Upside down would’ve been an appealing approach, but I ruled that out as an awkward read for the potential buyer. If that happens, I’ve lost the viewer. I want fast impact. Blam! “I want that.” If you’ve got them at the outset, they'll take time to ponder it later. Piling detail upon detail, cluttered on a cover, will not get that response. That’s what other publishers do. We had a number of discussions about this piece. I knew, and Irene was counting on, the idea that once it was composed, the rest was in the paint. That’s when the black took over. 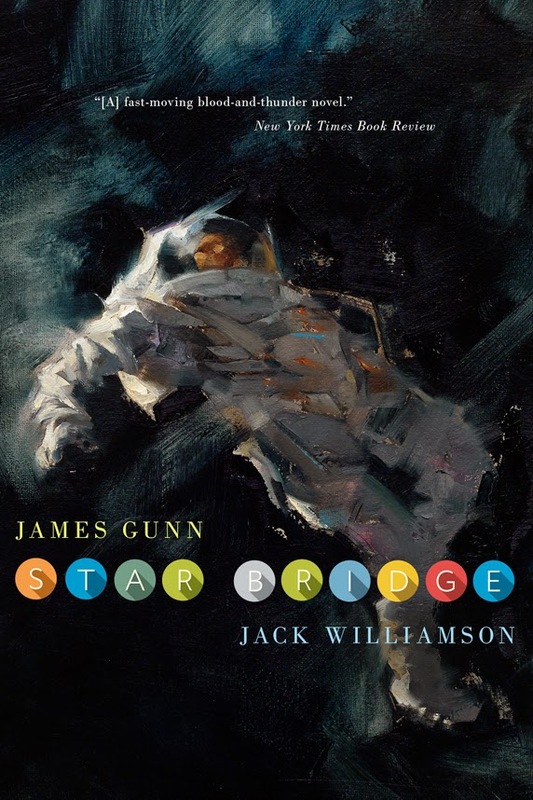 The black became an emotional sweep of paint and not necessarily the black of space. I mixed several cool, intense colors into a base of black pigment, with a touch of transparent earth, and let the strokes move in and out of clarity. I wanted to see the rhythm of the black. There are many fine conceptual illustrators in the field and as much as I’d love to work like that, and have on occasion, my concepts are subtle. I want the visceral staying power of simplicity. Clever is not enough. Conceptual thinking is being creative with the commonplace, and staying away from the staid approach of always thinking realistically, even when, as a painter, capturing realism. This gives lasting impact. 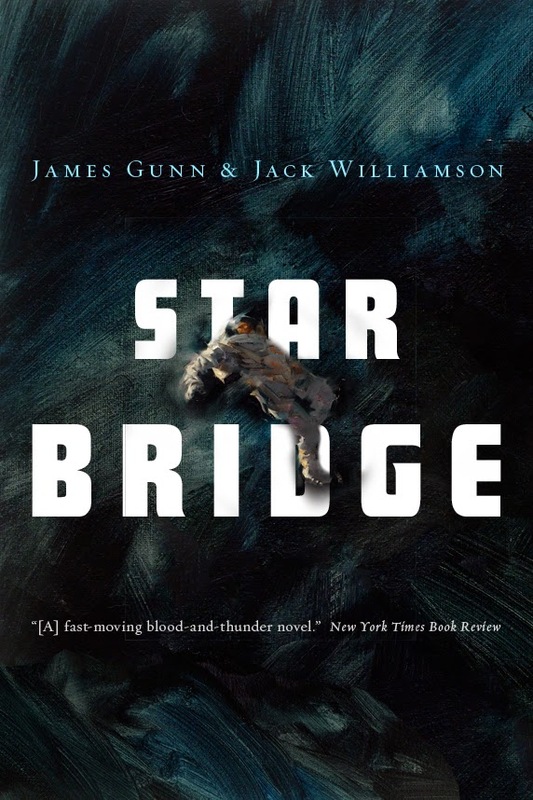 Included here are several iterations of the cover design. I love them all! We'll see which one they use.